I definitely underestimated for my first craft show how much time it would take to build enough stock for a craft show. Not to mention, I was usually guessing how much stock I would need, based on how much I could actually make. Which is the reason I developed a bunch of formulas and calculations to calculate stock levels based on different variables. Although you can never know for sure exactly how much stock you’ll need, the formulas in my ebook MAKE MORE MONEY AT CRAFT FAIRS (download the free sample chapter here) will make you much more accurate and save you time and money when it comes to making the wrong amount of stock or the wrong type of stock (very important too! WHAT SELLS BEST AT CRAFT SHOWS may be an article you want to check out). Once I figured out my realistic stock numbers and a way to prepare for craft shows strategically, I said goodbye to staying up until 2am the night before an event. Don’t get me wrong, I still had my late nights but they were less late and I felt more prepared. Each vendor has worked extremely hard for this day and everyone is hoping that their hard work is going to pay off, whether it’s their first craft show or their hundredth. I could never fully relax until I made my first few sales and covering the costs of the event was looking probable. The more vendors I talked to, the more I realized I wasn’t the only one. Regardless of your products, your business or the event, you never really know what each craft sale will bring so it’s important to relax and go with the flow. An hour may sound like a long time but once you factor in unloading the car, unpacking everything and getting the front and back of your table in order, opening time comes pretty quick. It’s really important to have everything ready to go; don’t leave tagging, pricing or sign making for the morning of or you’ll likely be scrambling. I wasn’t completely ready by the time the doors opened at my first craft show. It only added to my nerves and started the day off on the wrong foot. It’s better to give yourself more time for setup and be done early than scrambling and sweating to get it all done in time. Bonus points if you can get your behind-the-table supplies organized before the event too. Pre-stuff shopping bags with tissue and business cards, pre-cut ribbon, print off inventory sheets, etc. or create a system that allows you to work efficiently. You want to be able to ring customers through quickly and efficiently, regardless of whether there’s a lineup or not, so create a setup that works for your “cash desk” and “stock room”. At least I know I was at my first craft show and several more after that. You’re a creative person and I know you can probably make anything and everything. But don’t use craft fairs to show off your multiple talents. Use them to show off your best talent. The size of your space will determine how many groupings you can display but for an 8 foot table, a good place to start is with 3 – 5 groupings. A grouping may be a product (i.e. messenger bag, tote and clutch) or it may be a product line using specific design styles, patterns, textures, colors, etc. (i.e. floral prints, geo prints and damask prints). Mock up your table at home and step back to see how your space is feeling. Are there clear groupings the eye is drawn to or does it look overwhelming and cluttered? Keep it simple and let your products tell the shoppers exactly what your business is all about without having to say a word. Need a little direction on narrowing down your products and refining your selection? Sign up for our FREE challenge: 5 DAYS TO A STANDOUT DISPLAY. The first email talks about finding your ONE message, which is incredibly important and probably the most overlooked by craft fair vendors. 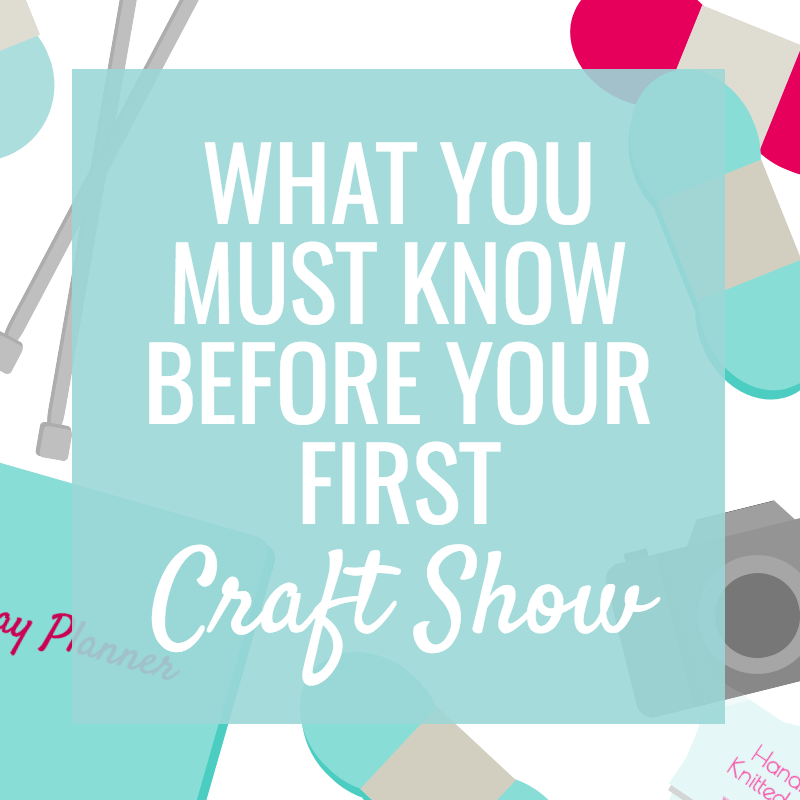 Are you the craft show vendor shoppers can’t quite describe? They sell a few pillows, a couple crocheted goods, I think they had some necklaces and maybe a couple pictures for sale? Or are you the vendor they want to find online, visit at your next event and tell friends about because you make really fun pillows for changing up the look of a room without breaking the bank? When you try to do too many things, everything gets put on the back burner and nothing becomes the main focus or stands out as extraordinary. You’re not looked at as the expert or THE person to go see when you need ____________ because you’re the best at it. Choose ONE main focus, get great at it and show shoppers why you’re the only choice when it comes to buying handmade ______________. If you aren’t sure what that focus is, pay attention to shoppers and sales stats at craft shows. Slowly start removing low preforming products from your lineup and adding more best sellers until you’ve found your niche. The free 5 day challenge will also help you find that focus. Trust me, I didn’t want “selling” to be necessary. I barely said “hello” to shoppers at my first craft show. I thought a smile and an answer for any questions was good enough. But once I actually started selling (and not in a What’s your name? Karen. Alright Karen, let me tell you how this purse is going to change your life, kind of way. In more of a getting to know shoppers, having a great convo and chatting about my products, kind of way) my sales went up. It’s not a guess or a personal opinion; across the board, no matter what you sell, you will sell more if you put effort into your sales techniques. Think about the selling points of each grouping of products; what’s interesting or unique about them or how they’re made? Who are they great for and why? You’ll feel a lot more comfortable if you have a line or two you can use while shoppers are at your table. The first craft show and a few after always feel a little awkward; there isn’t really the room to give shoppers their space while they browse and you’re watching them as they take in your work. But the more you learn about selling and the more you practice it, the more comfortable you’ll become. You and your shoppers will feel much more comfortable if you brush up on your sales techniques. Complete silence while they shop your table feels a little awkward for everyone. If you hate selling, you’ll find the PERFECTING YOUR SELLING SKILLS chapter of MAKE MORE MONEY AT CRAFT FAIRS really helpful. I’ve read a ton of books on the topic of marketing and selling to try and find the easiest, most comfortable way to sell. Through trial and error I’m sharing some of the best tips I’ve learned. I was definitely clueless my first craft show and admittedly put very little thought into my display. It was a small event but everyone had the most creative setups and props and I had a wrinkly tablecloth, a flat display, no branding and a hodgepodge of products. 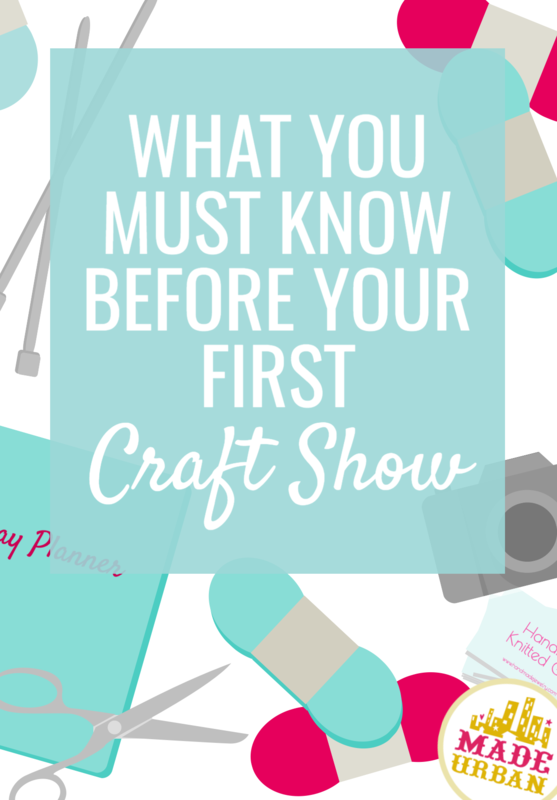 I quickly improved but there are so many craft show resources out there now (ahem MAKE MORE MONEY AT CRAFT FAIRS….download the free chapter here), you can hit the ground running with your first craft show. The FREE challenge: 5 DAYS TO A STANDOUT DISPLAY will also help walk you though a lot of little details most vendors don’t think of. It’s easy to jump into your first craft show without thinking through all the logistics of a business but it’s really important you get necessary permits and licenses and that you register your business. The sooner your start getting your business name in shopper’s eyes and ears, the sooner you’ll start building a reputation; and you don’t want to start with one name then realize it’s already been registered by someone else and you can’t use it. You want people to use your business name when they tell their friends where they picked up their awesome new handmade item. If you’re not communicating it at your booth, on your tags and through other marketing material, people will quickly forget what your business is called. It’s easy to look at the position of your booth and start worrying about whether you’re in a good spot or not. Some booths may seem like they’re in a better place than others but you can find reasons for and against any position; i.e. Right at the front – PRO: first booth shoppers see, CON: shoppers want to look around before committing. But at the end of the day it’s your display, products and attitude that determine your sales, not where your booth is. Worry more about this and this than your location. It can be the perfect venue, with perfect weather and the event may have a rock star organizer…but that doesn’t always mean you’re going to sell out. Each event is different and each day of an event is different. Often the products you think will sell like hotcakes, don’t get picked up but the items you made a few of to test out, will be flying out of there. You can’t always make sense of it and you need to go into each event with an open mind. If you’ve done your research and feel you’ve picked a great first craft show to be a part of, relax, go with the flow and trust you’re in the right place at the right time. And if you happen to be at an event you hustled your behind off to make tons of stock for and it’s just not selling…..not to worry! I include several ideas to get creative and get that stock moving, in MAKE MORE MONEY AT CRAFT FAIRS. Often the other vendors participating in an event are your target market; they love and appreciate handmade just as much as you do. Instead of purchasing each other’s items, vendors may ask if you’re interested in a trade; you get one (or more) of their products in exchange for one (or more) of yours. If you’re not interested, you can let them know how much you love their work but that you’re really looking to make some extra cash this craft sale so unfortunately you’re not in a position to make trades. If you are interested, get your trade on! I do like to leave trades until the end of the event so I can be sure I have as much stock as possible for the shoppers but when and how you trade is totally up to you! Everyone is really connected in the craft community, regardless of how big or small your city or town it. It can feel intimidating walking into your first craft show feeling like everyone knows each other but I assure you, it’s one of the friendliest communities out there. Be sure to take the time to walk around the event and introduce yourself (be mindful of their setup time or customers; you don’t want to interrupt, but a quick “hi” goes a long way). Everyone gets to know you really quickly so it’s also important to keep a good reputation. If you have a bad experience at a craft show, remain professional; word will spread really quickly if you’re difficult to work with. They will all seem like opportunities to make money but it’s much more important to choose the right craft fairs than to say yes to every one that comes your way. Take the time to research the event, the organizer, the location, etc. The time it takes you to apply, create product, set up, sell and take down, is time that may be better spent somewhere else in your business if it’s not all done for the right event.